This software, designed for Microsoft Windows, will allow you to print ASCII text files using any printer with a Windows driver. The file can be generated from a DOS/WINDOWS application or a UNIX/LINUX application, if it resides on a file system that is accessible from the Windows box (NFS, SCO-VisionFS, Samba and others). PrintFil is a stand-alone software, it runs in background and doesn't need to be Start ed by the application that creates the print jobs. This is why it can be used in several different applications. PrintFil can also add a lot of other interesting features to existing applications, including preview and export of print jobs in PDF format. This software, designed for Microsoft Windows, will allow you to print ASCII text files using any printer with a Windows driver. If you are developing host based applications (like Unix) and your customers are using them with a Windows Terminal Emulator, You can stop to fight with transparent-print characters and different settings for different printers. All You need is a shared file system and PrintFil. 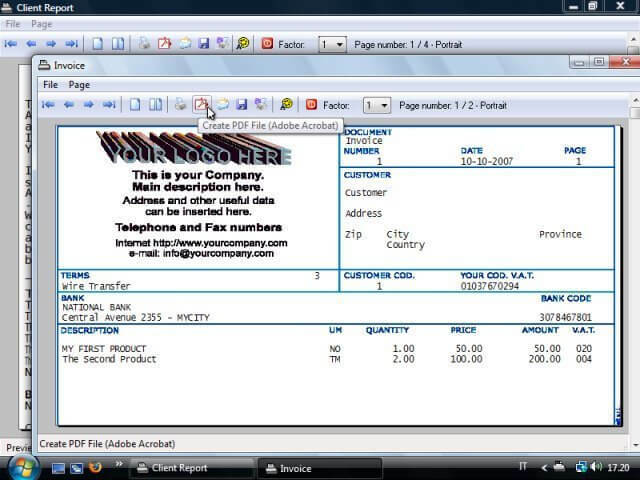 In this example there is a single Windows PC (95, 98, ME, NT, 2000, XP) on which is running a MS-DOS software to print to a USB printer and to send the print jobs via fax using the modem. Some Apple II applications, specifically designed to run on an Apple PC (and usually on an Apple Imagewriter or Laserwriter printer) can be run on a Windows PC using the well known emulator: Apple II Oasis by BG Universal Software Inc.